Before adjusting the door position for vehicles equipped with side airbags and curtain shield airbags, be sure to disconnect the battery. After adjustment, inspect the SRS warning lamp, the side airbag system and the curtain shield airbag system for normal operation. Then initialize both airbag systems. (a) Check that the value is within the standard value. (a) Disconnected the negative (-) terminal cable from the battery. (b) Using SST, adjust the door by loosening the body side hinge bolts. (c) Tighten the body side hinge bolts after the adjustment. 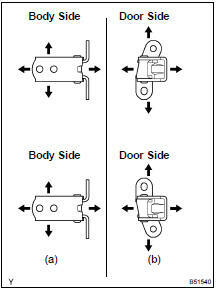 (d) Adjust the door by loosening the door side hinge bolts. (e) Tighten the door side hinge bolts after the adjustment. (f) Adjust the striker position by slightly loosening the striker mounting screws and hitting the striker with a plastic hammer. (g) Tighten the striker mounting screws again. (h) Connect the negative (-) terminal cable th the battery. (i) Initialize both airbag systems. (j) Inspect the SRS warning lamp (see page 05-1207 ).